There was much more to it than simple technique, however, because above all Kurt Vonnegut cared about what he wrote. He burned with moral anger – a permanent outrage at the folly and hypocrisy of a society, a world, which blighted lives that could have been happy and fulfilled. The sense of a paradise lost when it is so close to being found is, for me, what makes his writing so poignant. 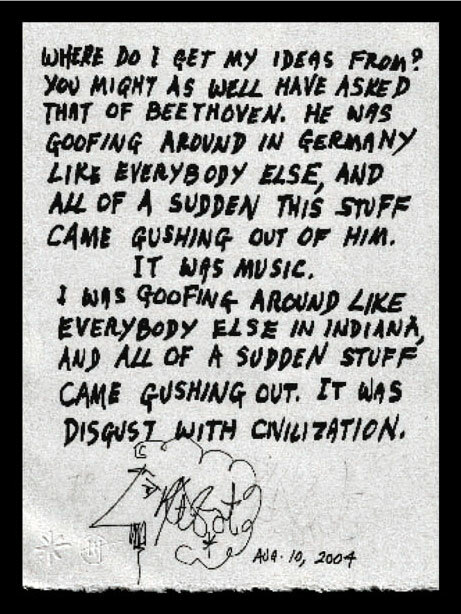 Humour is perspective, it’s often said, and we would surely be all be the poorer without Kurt Vonnegut’s wry vision. If you’d like to read a little more (a concise two-page article) about how he brought style and personality to his writing, just click on the following link.